Equine Gastric Ulcer Syndrome (EGUS) is a term that covers the damage and ulceration of the stomach lining in the horse. EGUS is a very prevalent disease affecting horses. 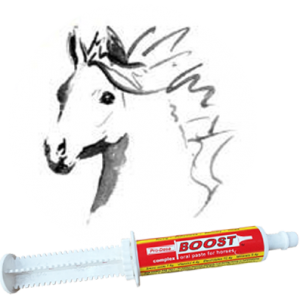 EGUS is found in up to 90% of all race horses and endurance horses. The incidence of EGUS in sporthorses can also be as high as 60%. 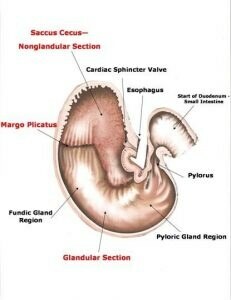 The Stomach and Digestion Process. The stomach is small relative to the size of the digestive tract of the horse and has a small role in the digestion process to help further liquefy food particles as they pass through to the small intestine. The stomach has two distinct areas the non-glandular section which is located the top one third of the stomach and has the same thin, smooth wall lining as the oesophagus. The glandular section of the stomach is the remaining two thirds of the stomach its wall lining is made up of glands which secrete hydrochloric acid, pepsin, bicarbonate and mucous. The horse is unique in that it continuously secretes hydrochloric acid to break down food particles. It also produces the enzyme pepsin that helps break down proteins. It is these gastric acids that ultimately damage the non-glandular region of the stomach as this area has thin, smooth walls which are not protected by glands as found in the glandular region of the stomach. The time it takes for feeds to be digested in the stomach varies with the type of feed, forage or grain and the size of the meal. Grain can take as little as ten minutes to pass through the stomach and forage can take up to 24 hours so the stomach has little time to empty and hydrochloric acid is being used to break down food particles. To address EGUS, our aim is to neutralise the stomach acid and the horse has its own neutralising agent bicarbonate which is produced in its saliva. 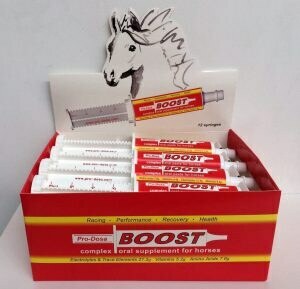 As a horse chews it produces saliva the more time it chews the greater the amount of saliva thus bicarbonate produced. The bicarbonate then reacts with to neutralize the gastric acids. It is important that all stable staff know the horses that are in their care so they are able to determine when there has been a change in their behaviour, eating habits, weight loss etc which could well mean the early detection of EGUS. The following are clinical signs that different studies have found can indicate EGUS. The only way to absolutely diagnose EGUS is by gastroscopy which is a long endoscope with a light and camera that is passed into the stomach via nostril and eosphogus to identify any ulcerations or damage to the stomach lining. Provide high quality forage ad-lib, 1 kg of forage requires the horse to chew approximately 3000 times producing high quantities of saliva and bicarbonate to help neutralise gastric acid. Alfalfa high in protein 21% and calcium is ideal as there are buffering qualities provided by the calcium. Provide Water ad-lib at all times – water is required to produce saliva and studies show horses who are intermittently without water are more susceptible to ulcers. Keep horses on pasture 24/7 if at all feasible, as they are grazers and can do so for up to 18 hours per day and this will help keep feed passing through the stomach working to neutralize gastric acids. If horses are stall confined, make sure they can see other horses and can socialise to reduce stress. Give them a ball or something else to keep them amused and free from boredom. Feed smaller feeds more often, due to labour and time constraints many stables make the mistake of only feeding horses twice a day, which means the horse can go without feed for a period greater than six hours which studies suggest increases the likelihood of EGUS. Horses were designed to graze throughout the day not eat once or twice. Start with forage and build the diet from there adding a vitamin and mineral balancer then adding energy sources to meet requirements of the horse. Remember you can add fats such as oils to replace grain. If the horse bolts its feed place rocks in its feeder to try and slow its feeding rate down making it chew the feed, which means it takes more time for the feed to pass through the stomach. Transportation is a cause of EGUS – to help eliminate this break up longer travel periods to allow for rest, feed and water. Provide a travel companion to help alleviate stress. Performance horses are more susceptible to EGUS as they are often fasted prior to racing or competing, this needs to be addressed by the stable so the stomach does not completely empty out. Grains and or concentrates should never make up more than 1 – 2 kg of any meal given to the horse. Especially if it contains Sweetfeeds as these contain VFAs (volatile fatty acids) which can cause damage to the non-glandular stomach lining. Turning the horse out on pasture with access to quality forage for a period of a month will most likely allow the healing of any stomach ulcers, however this may not be practical for performance horses. The only registered treatment for the treatment of ulcers is Omeprozole (Gatroguard or Ulcerguard). There are other solutions available that line the stomach to help reduce the pain associated from ulcers. If you require a PDF version of this fact sheet please click here and we will send one to you.